The strength of Irupathiyonnaam Noottaandu comes more from its two leads than its script. I guess calling it a romantic thriller would be more appropriate (it is billed as an action-adventure romance drama), even though the thriller elements are few and far between. These elements are more prominent in the second half, which is when the film really comes alive. 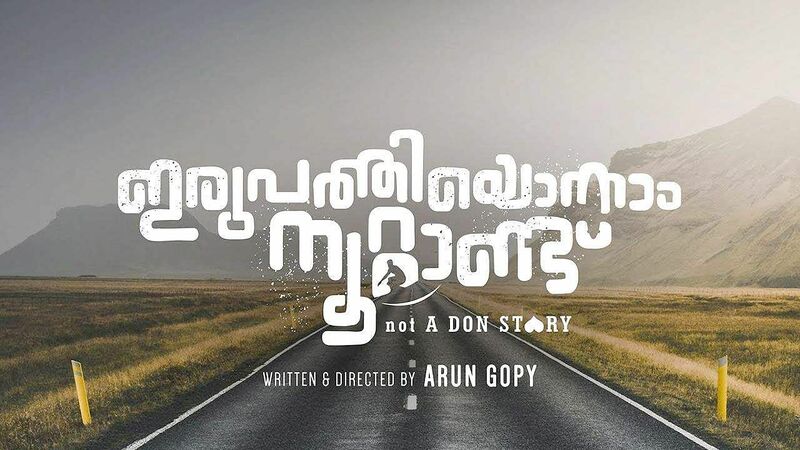 The trailers suggested that Pranav's character, Appu, could be the son of Mohanlal's iconic character, Sagar alias Jacky from Irupathaam Noottaandu (1987), but there is no connection here whatsoever to that classic. Appu's father is actually a Goa-based don named Baba (Manoj K Jayan), who embarrasses his son on multiple occasions. There are times when Baba makes you wonder how he got to be a don given his buffoonery. But he dotes on his son and is proud of the fact that Appu is more daring than him. He is an understanding and supportive father. Arun Gopy seems to have so many things to say, but he gives us the sense that he is more interested in individual moments than the overall picture. However, the film doesn't take itself too seriously. The atmosphere is more Rohit Shetty-style fun than Anurag Kashyap-style serious. When Baba's rival (Kalabhavon Shajon) crashes his New Year party demanding he pay back the money he is owed, Appu has no choice but to get involved. But Appu's mission takes a backseat when Zaya (debutant Rachel David) enters the scene. The surfer dude is now distracted. We are too. The deeper we go into the film, we nearly forget to ask, "But what about the unpaid debt?" This is essentially a message-driven film meant to reflect our current social climate -- topics like sexual abuse, religious disharmony, and the negative impact of media are touched upon -- but in the garb of a mass entertainer. Barring a couple of portions in the first half, Rachel David does a commendable job as the fun-loving, adventure-seeking Zaya. The film is at its most engaging when the pair is on screen. The first half is akin to a tourism video, with Goa's picturesque locales and tourist spots becoming the primary focus instead of the main story, and the pace suffers as a result. The film would've been much more gripping if 20 minutes were left on the cutting room floor. Plus, some of the humour is cringe-inducing and is straight out of a stage show. A male character, who is supposed to be the comic relief, repeatedly asks Appu, "Are you crazy?" as if it wasn't already apparent. His attempts to sound like Jagathy don't help things either. The film shows us a side of Pranav we have never seen before (like an energetic dance sequence inside a casino). He is more relaxed this time, doing things he never got to do in his debut film, Aadhi. Also, a drunken scene evokes his father's scenes from Adhipan and Chithram. As in Aadhi, Pranav displays his remarkable ability to perform high-octane stunts. A train stunt, in particular, is nail-biting. This is only his second film, and I'm sure we'll see him evolve into a much better actor in the coming years. While the film itself doesn't break any new ground in terms of storytelling, it certainly proves that Pranav is capable of breaking out of his comfort zone.